The Dream of the Red Chamber, a ballet co-produced by the Hong Kong Ballet and German company Ballett Dortmund and choreographed by Wang Xin Peng, Artistic Director of Ballett Dortmund, is caught up in a censorship scandal involving mainland Chinese authorities in Hong Kong. Inspired by a famous novel in the Qing Dynasty written by Cao Xueqin, the Ballet Dream of the Red Chamber, is about China's modern history. As choreographer Wang Xin Peng experienced the Cultural Revolution in China and left his country after witnessing the June 4 Tiananmen Crackdown, he has injected his personal reflections onto the Ballet. Below is a video uploaded by Ballett Dormund showing some scenes from “The Dream of the Red Chamber”. 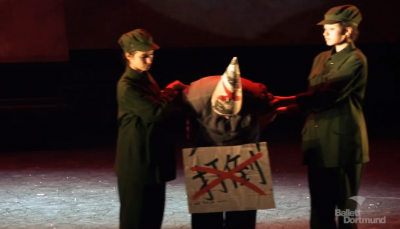 A censored ballet scene depicting the Red Guard's campaign to destroy the Four Olds during the Cultural Revolution was removed by the Hong Kong Ballet before first night. In addition, a 12 minute background projection of a scene with Pao Yu, the main protagonist of the story, reflecting on the history of Grand View Garden or Daguanyuan, a metaphor of Chinese history in Wang's Ballet, was removed after the opening show. The projection carries images from Ming and Qing Dynasties to contemporary China and it has snapshots showing the Cultural Revolution as well. Such abrupt post-production censorship has outraged the cultural circle in Hong Kong and many believe that the Beijing government is behind the scene. We are not informed of any cuts on purpose made in the production – and we haven't given permisson to do so. We have been officially informed though that there were serious technical problems in the venue, which concerned the video and text in the performances after the opening night. We sincerely hope that these problems are being solved for further performances! The elements of the third act are important to understand the intention of choreographer Wang Xin Peng. He wants to focus on the the relevance of the story for our present age. The third act shows Chinese history from the Emperor time up to today: The cosmic stone seeks the experience of eternal love. 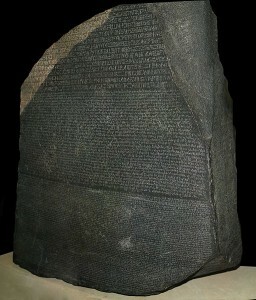 Since eternal is the essence of life as a whole, the stone goes through not only one human life, but through the lives of 300 years in history. This time-journey through 300 years in history from the middle kingdom up to today is shown in the 3rd act as well through videos and costumes. Without any valuation but rather as a reflection of the history of Mr. Wang's home country, this final part of his work is essential and makes it complete. The Hong Kong Ballet denied that any political censorship was involved and insisted that the decision to change the Cultural Revolution costumes and remove the projection of 12 minutes of Chinese history was based on artistic and technical consideration. Scene of red guards denouncing the capitalist in the Dream of the Red Chamber. Screen capture from Theater Dortmund's Youtube video. In the rehearsal of October 24, in the latter half of the ballet performance, the background of the stage was Tiannanmen and Mao Tsedong's portrait was hanging on the wall. Some dancers dressed as Red Guards appeared on stage, they had the little red books in their hands and waved them to Mao's portrait. The next episode was “destroy the four olds”, dancers were tearing apart paintings, burning old books that represent feudalism, denouncing the capitalists etc. Hong Kong Ballet and even Hong Kong Dance Federation Limited, as well as the direct sponsor policy of arts development, are very rotten, pro-Beijing government. According to Ming Pao [a local newspaper] Hong Kong Ballet was sponsored by the Hong Kong Arts Development Council (ADC). But in 2007, it was put under the direct sponsorship of Government Home Affair Bureau among 8 other performing arts groups. The funding amount has increased under the new policy. For example in 2007, ADC only funded Hong Kong Ballet HK 13,460,000 dollars [US 1,736,083 dollars], the amount was raised to 24,910,000 [US 3,212,915 dollars] in 2008 and 31,580,000 [US 4,073,219 dollars] in 2012. The company made 8,330,000 [US 1,074,411] profit last year. – “Funded by HAB”? Tsang Takshing is in charge! It is like a defacto unit of the United Front Work Department of the Chinese Communist Party. 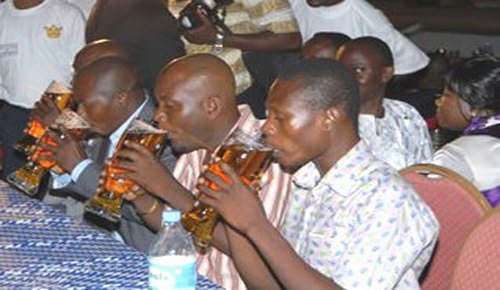 In Germany, a major producer of fine hops, Oktoberfest is a traditional gathering where people have good, harmless fun. But here every year, the open access to alcohol is an opportunity for drunken obnoxious behaviors [..] To see 100,000 youngsters come to Beer Festival and then merely 300 show up at job fairs saddens me a great deal. 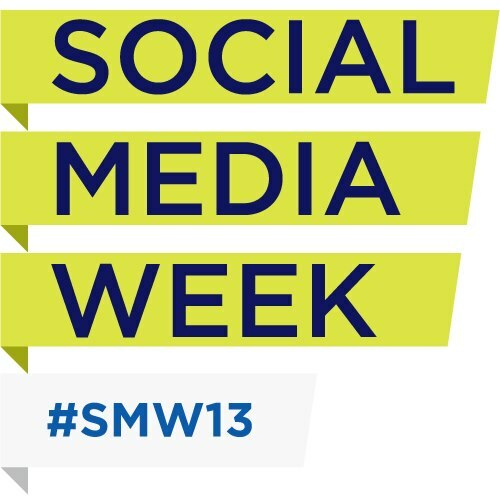 Social Media Week, a worldwide event which ”brings people, brands and organizations together to explore how we connect and communicate as a society”, starts today, September 23, 2013. In the second edition of this year's global conference, with the cities of Berlin, Bogotá, Chicago, London, Los Angeles, Mumbai, São Paulo and Toronto as hosts, more than 1,000 events are expected to take place ”exploring the social, cultural and economic impact of social media”. 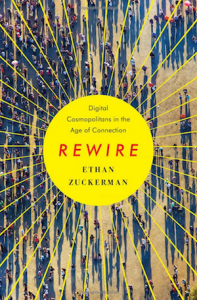 The book “Rewire: Digital Cosmopolitans in the Age of Connection“ written by Ethan Zuckerman, co-founder of Global Voices, examines why the extraordinary potential for communication that technology brings doesn't necessarily translate into stronger connections between people. In “Rewire”, Zuckerman describes in particular the important role translators play in facilitating a better understanding of world events in context. One of the concept that Ethan Zuckerman discusses in depth is serendipity. He argues that our consumption of content on the internet tends to revolve around the same media outlets. To expand our intake of news online, we need to allow serendipity to guide us towards a more diversified media consumption. Scientific intuition is seen as one unifying or illuminating idea, which comes about as a solution to a problem that engrosses the researcher. It emerges unexpectedly from some strange parallel universe, while one is consumed by pressing problems, or sleeping. In these conditions, it is essential to have the following: the profound desire to know the answer, the arsenal of memorized facts that are related to the problem, a sense of freedom, the ability to break through routine, the discussion of the problem with other researchers [...] It is perhaps precisely when scientists reflect on their experiences of creativity and serendipity that the so-called “rigid” sciences are most likely to find common ground with the humanities, the arts, the human and social sciences, becoming more receptive to their speeches and their approaches. It is there that reflexivity (in conjunction with serendipity) involves freedom and breaking free in the face of dogma and epistemology. It has become impossible to understand things from an outside perspective. To examine organizations, or societies that are challenged by increasingly complex and conflicting issues, after having built up a multitude of skills and modes of behavior and a great deal of diversity. [...] The perpetual stream of uncurated news ends up preventing any coherent attempt to analyze events. 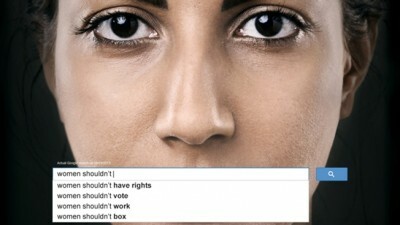 It reinforces stereotypes and does not allow for objective understanding. There is no room for a broader perspective or taking a step back in time and space. [...] (It is instinctive) to draw conclusions from the specific to the general; from local to global. Cosmopolitanism is the awareness of a common destiny that, from this moment on, unites all parties of the world in sharing the same risks. [...] Therefore, it is not a question of a cosmopolitanism that is imposed by some authority, as embodied by organizations such as the UN or the International Court of Justice. Nor does it mean that the world is becoming cosmopolitan and more accepting of cultural diversity and increasingly polyglot, or that we are all more aware of this shift. It simply means that there is in fact, a cosmopolitan movement that is emerging from the ground up and that is changing our everyday lives, our habits as consumers, our political lives, even how we view things within our own borders. You can sort of call it an “everyday cosmopolitanism” [...] The overall risk may be one of the forces that is capable of producing cosmopolitan institutions that can overcome those interests normally understood only on the national level. Because people and countries can learn that national problems need to be resolved in the context of a cosmopolitan society. This cosmopolitan perspective is in fact realistic, it's nationalism in this context that is idealistic. It looks to the past and doesn't offer any real solutions to societies. Alle regierenden Parteien wussten dies und müssen sich über die langfristig verhehrenden politischen und entwürdigenden Konsequenzen klar gewesen sein, wohlweißlich, ohne darüber jemals dem Volk Rechenschaft gegeben zu haben; die sogenannte Kanzlerakte und die himmelschreiende Tatsache, dass sich einige CDU/CSU-Abgeordnete am Anbeginn der Regierungszeit Willy Brandts zu einer geheimdienstlich agierenden Einheit als parlamentarischer Ableger des BND bzw. BAVerfS erklärten (die Einheit bestand bis zum Amtsantritt Helmut Kohls), gibt jene zynisch-anbiedernde Haltung der deutschen politischen Klasse zu erkennen, die sich bis heute nahtlos fortsetzt. The recent unrest in Turkey has left eight dead and more than 4,000 injured as well as exposed political divides and ineptitudes in the country that straddles Europe and Asia. But the consequences of the massive protests, which grew from a movement to stop the destruction of Istanbul's Gezi Park for a redevelopment project in Taksim Square, have extended far beyond the borders of Turkey. 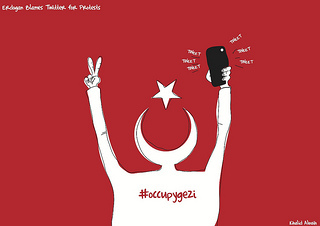 Everywhere, Taksim is being compared to Tahir, the Turkish spring to the Arab spring. 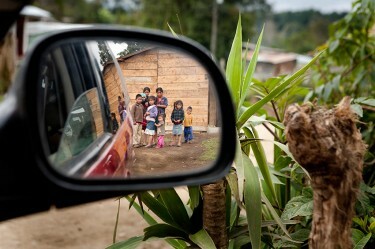 In the images making the rounds, we see the same social groups – students, educated middle classes… – leading the field. They feed their ambitions with the cosmopolitan cultural kit spread over the Internet and which now forms the stock ideas of the “fashionable” schools of thought in societies in transition. The means of mobilisation brings them together too: slogans begun on the Internet which spring up in networks without headquarters, where any instructions are repeated so long as they correspond to expectations, no matter who starts them. 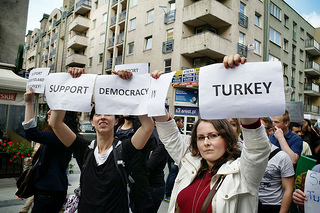 The only Europeans in Turkey are those in Taksim Square and their supporters! A partnership agreement: yes, but accession to Europe: no! Turkey is not European. We don't share the same culture, nor the same Judeo-Christian roots, nor the same political aspirations. Europe shares Judeo-Christian roots which were sown… in Turkey! The first Council of Nicea was in 325, and the first Council of Constantinople took place in 381. (…) Arrogance is rooted in ignorance. Mr. Proust jumps feet first into the pretext given by Erdogan, and ends up putting his foot in it. He is conflating the Turkish people with their leaders. Political grandstanding in all of its glory! (…) Insisting on europeanising the worthy successor of the Ottoman Empire is an illusion, an idyllic vision of the future of the European Union. Just because 5 percent of the population adhere to the ideas and values of the EU doesn't means that 95 percent of Anatolians will do so. Just because Constantinople has become Ankara, it doesn't means that the mentality of the Ottoman leaders – whether Kemalist or (moderate?) Islamist – has changed. “From Azerbaijan to Senegal, everyone sympathizes with the protesters in Taksim Square, not with Erdogan”, concludes Hakan Günes, Professor of Political Science at the University of Marmara. Turkey is a country where everyone fears the other. Kemalists fear Islamists, Islamists fear secularists, women fear men, children fear adults… It's the American mentality: we are always under threat. While I happily keep giving the #USA the bashing they deserve about mass #surveillance of citizens, you won't hear me cast the first stone about industrial #espionage – for well-known reasons. Smutny frankly said “#France is the evil empire stealing technology and #Germany knows this”, but Germany´s decentralized government is not willing to do much about it. Going on at length of his despise of the French, Smutny said French IPR espionage is so bad that the total damage done to the German economy is greater the that inflicted by China or Russia. German musician Davide Martello performed live during the protests in Istanbul's Taksim Square. This track is dedicated to the Soldiers of Light, the victims of this insane violence by the turkish government. Composed during the protests in Istanbul two weeks ago… live in the crowds on Taksim Square. The small island of Cyprus continues its race against bankruptcy. Following the European decision to tax all depositors, [fr] the Mediterranean republic faces a critical situation. Three options are emerging for the island: to carry out an agreement with Europe, to turn to Russia, or to declare bankruptcy and leave the Eurozone. This crisis arose after a significant loss in assets of the Popular Bank of Cyprus and the Bank of Cyprus, from the March 2012 debt restructuring plan in Greece. After which the two Cypriot banks found themselves obligated to seek recapitalization in capital city Nicosia [fr]. Greek banks are closely tied to Cyprus. The Bank for International Settlements, [fr] or BIS, estimates the Greek banks’ investments in Cyprus to be up to 12.6 billion euros. This amount is about 28% of all Cypriot banks’ investments. Given this already high participation of Greek banks in the Cypriot private sector, it rules out the possibility of further participation from the private sector in the island's recovery plan. So, if Cyprus could contribute from its banks the sum of 7 billion euros, refused to them by Europe, out of the 17 billion euros which it owes, Europe would be obligated to give one more time to Greece [fr], further weakening the country. A renegotiation, particularly in the plan of the troika, would be risky. This is also partly why the Greek economy is affected by tax on deposits. Furthermore, organizing a private-sector intervention in Cyprus might be frowned upon by investors. It should not be forgotten that “the Greek case” is expected to remain unique. Otherwise, it would be tempting for other countries now experiencing a complex economic situation, such as Spain, Italy or Portugal, to seek private-sector assistance as well. The consequences of this would be irrevocable. For the market to finance vulnerable states would become complex, even impossible, and restructuring of public debt for other countries, and of the European Central Bank, would loom dangerously on the horizon. In fact, regarding the deposits, this is another “unique case” which Europe hopes to create. The Social Democratic Party of Germany [fr], or SDP, wants to make an example of Cyprus, in order to stop the vote in favor of European aid in the Bundestag [fr], which is essential to Chancellor Angela Merkel. So, aid for Cyprus is not likely to occur without the support of the Bundestag. The SDP sees a reserve of money in Cyprus which is noted to be of Russian origin, and suspected to belong to the “mafia”. The private sector intervention did not really hit the wallet of Russia, so the European solution should focus on deposits. Since Cyprus refused to accept a drain of deposits more than 10%, so as not to ruin the reputation of its economic system, it was necessary to broaden its tax base, and to spread the impact across all depositors, including residents. But this could still be enough to push Cyprus into the abyss. This is why it rejected the European plan. At this point, Cyprus finds itself faced with several possibilities. Given the intense reactions in Europe, and especially in Cyprus, during recent days, some of the European decision-makers seem to want to backtrack, regretting their original choices. We see attempts to reduce the participation of Cyprus in its own bailout. However, Europe may not accept an attempted renegotiation. The debate about the complete participation of the ESM (European Stability Mechanism) [fr], which oversees 5.8 billion euros in aid, still remains. The second solution would be for Cyprus to ally itself with Russia. Indeed, Putin wants to defend Russian assets on the island, asking, in exchange, for large concessions on gas, Russian military facilities, not to mention the recent discovery of an oil deposit off the island. Russia could repurchase Cypriot banks [fr], notably the Laïka Bank, the second-largest banking establishment on the island, in order to save 2.5 billion euros in recapitalization. Russian aid would probably be complementary to European aid, and undoubtedly there would not be any actual rupture between Cyprus and the Eurozone. For its part, Russia would gain significant influence in strategically important Cyprus. The island would safeguard the interests of Moscow in Europe, but would risk creating some problems in the future. First, there are two banks in critical condition that would need to be cleaned up. It would be absurd to suggest that we would have an interest in those. Our only interest is to regain the ability to make payments as quickly as possible, and to manage the accounts of our clients. arrêter son activité et quitter purement et simplement le marché chypriote” en cas de “décisions violant le droit, dictées par la politique. cease its activity entirely, and simply leave the Cypriot market” in the event of “decisions which violate the law, dictated by politics. Finally, Cyprus can opt for the extreme but inevitable solution, if Russia and Europe deliver no proper support – bankruptcy. Then, recapitalization in Cyprus would be accomplished by banks issuing money. That would mean leaving the Eurozone [fr], instituting strict controls over the flow of money, and blocking current accounts during the period of conversion to the new Cypriot currency. The island would be ruined, and its financial credit would be permanently damaged. This would be followed by a period of economic reconstruction under complex circumstances. And for the Eurozone, it would be a failure, and a disturbing precedent. What will the price of a Cypriot euro be, relative to a German euro? 50%? I call this Cyprus leaving the euro, but keeping the word “euro”, to save face. 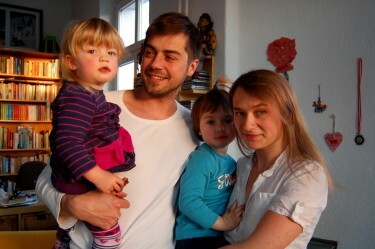 A German man who marched in an anti-nuclear protest two years ago [zh] in Taiwan was detained at Taiwan's international airport and denied entry [zh] into the country on March 8, 2013, a day before protesters planned to hold a large-scale anti-nuclear demonstration there. Daniel Andres Helmdach is scheduled to be deported from Taiwan, a suspected consequence of his participation in an anti-nuclear demonstration in Kaohsiung on April 30, 2011 [zh] while he was in Taiwan working as a volunteer on conservation projects. This is not the first time that Taiwan has zeroed in on the participation of foreigners in anti-nuclear activities in Taiwan, where the recent construction of the fourth nuclear power plant in Taiwan has been met with strong criticism because of security concerns. Two Japanese people from Fukushima were warned by the country's immigration office [zh] immediately after they gave a speech at an anti-nuclear demonstration on April 30, 2011. The country's premier, Yi-Hua Chiang, has called for a referendum to be held on the construction of the Fourth nuclear power plant in August 2013. Our good friend arrived in Taiwan this evening for sightseeing. His entry was rejected at the Tauyuan International Airport because he joined our environmental education observation activity two years ago in Taiwan. To our surprise, he was targeted and is now prepared for deportation without any notice in advance. Legislator Shu-Fen Lin called the head of the immigration office and requested them to explain the deportation of Daniel. The immigration office said [zh] that the National Security Council made the decision in 2010 that should a foreigner conduct anything not described in his or her visa, the person would be denied entry to Taiwan three years. He helped the Linluo church’s communication reconstruction project after Typhoon Morakot and joined the surveillance activities of the waste on the beach and related nature conservation activities. 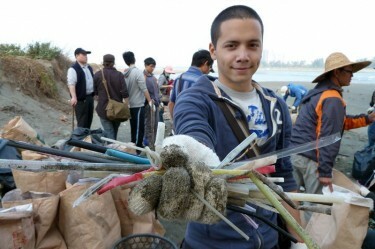 He worked very hard in Taiwan and fulfilled his responsibility as an international volunteer. He cooperated with us and helped complete our projects. He did not conduct anything unseemly. After the Fukushima nuclear accident in Japan, Daniel studied issues related to nuclear power and walked with his friends from the Community College in Tainan City during the anti-nuke demonstration [zh] in Kaohsiung on April 30, 2011. Soon after the demonstration, special agents visited the Community College in Tainan City and the Tainan branch of ICYE, but they did not mention anything about Daniel's involvement in unlawful activities. Writer, human rights advocate, and French resistance fighter Stéphane Hessel, whose bestselling manifesto on peaceful uprising inspired the disenchanted of Europe and the United States to organize into protest, died on the night of February 26, 2013. He was 95. 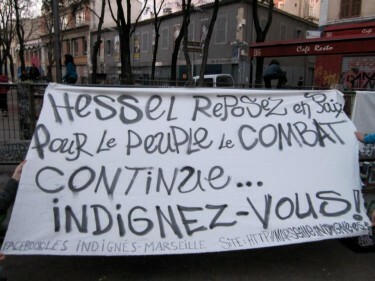 Hessel came to the worldwide recognition with the 2010 publication of his short pamphlet ”Indignez-vous!” (Time for Outrage! ), which quickly became a publishing phenomenon – the work has sold some 4.5 million copies in 35 countries including China and been translated into 34 languages. The manifesto became the bedrock of global protests, including Spain's Indignants movement and the international Occupy movement. 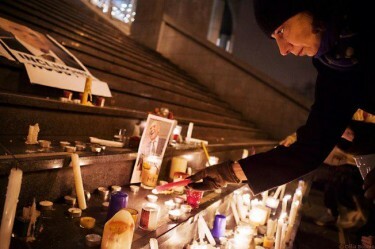 Following the news of his death, more than 500 people paid homage to him at the Place de la Bastille in Paris. A peaceful march is planned on March 7, 2013, the day of his funeral. Cette expérience m’a ouvert politiquement. Nous étions là, solidaires, à partager un douloureux quotidien entre des milliers d’Européens. Il y avait là un brassage, une génération qui a inventé un monde nouveau dans son opposition au nazisme. This experience was a political awakening. There were a thousand of us, fellow Europeans, sharing a very painful lot, and supporting each other. It was a melting pot, a generation whose opposition to Nazism had given rise to a new world. Internet users celebrate Hessel on the page Facebook “Par millions rendons hommage à Stéphane Hessel” (One million pay homage to Hessel). J’ai le sentiment d’appartenir à l’histoire des Juifs, d’autant que la Shoah m’a touché de près. Je me suis enthousiasmé pour le sionisme et la création d’Israël. Mais je ne partage pas le repli d’une partie de la communauté juive. Je déteste l’entre-soi communautariste. Depuis 1967, je refuse la politique de colonisation et de territoires occupés par Israël. Gaza est une prison à ciel ouvert. I feel that I am a part of Jewish history, especially having been so personally affected by the Shoah. I was enthusiastic about Zionism and the creation of Israel. But I do not share the inward-looking attitude of a certain part of the Jewish community. I abhor self-centered isolationism. Since 1967, I have rejected the settlement policy and the occupied territories of Israel. Gaza is an open-air prison. Today this pro-Palestinian stance has earned him severe posthumous criticism from the Representative Council of Jewish Institutions in France [fr]. So, let us all commit to a truly peaceful insurrection against mass media, whose only offer to our youth is mass consumerism, contempt for the weak and for culture, widespread amnesia and merciless competition pitching everyone against everyone else. To those who are going to create the 21st century, we say, with all our affection: TO CREATE IS TO RESIST. TO RESIST IS TO CREATE. Nous ne sommes nous-mêmes que lorsque nous essayons de nous dépasser, lorsque nous ne nous contentons pas de l’acquis. We only come into our own when we seek to surpass ourselves, when we are not satisfied with what has already been achieved. Je constate avec plaisir qu’au cours des dernières décennies se sont multipliés les organisations non gouvernementales, les mouvements sociaux […] qui sont agissants et performants. Il est évident que pour être efficace aujourd’hui, il faut agir en réseau, profiter de tous les moyens modernes de communication. I am pleased to note that over the past few decades, more and more active and efficient NGOs and social movements have appeared [...] These days, it seems quite clear that in order to be efficient we need to network and make the best use of all modern means of communication. And thus, demonstrators in France, Spain, Greece, Italy, and Portugal throughout 2011 and 2012 began to call themselves The Indignants, or in the case of New York, Occupy Wall Street, in line with Hessel's writing. The pamphlet also found a significant place in the recent uprisings against dictatorial regimes in the Arab world. La aportación más importante de Hessel al 15-M fue la de transmitir, con su edad y trayectoria política, un tipo de credibilidad que los grandes medios necesitaban para poder hablar de las movilizaciones en calle sin sentir que daban voz a lo que caricaturizaban como un latido antisistema. [...] Su palabra, “indignación“, fue un regalo: un ejemplo perfecto para la nada y el todo a la vez. Para esa militancia inclusiva que usaba términos que no dejaran a nadie fuera. Stephane Hessel's main contribution to the 15-M movement is that, due to his age and political career he has conferred a necessary credibility to mainstream media, so that they may speak of citizen mobilization without having the impression of giving voice to what they caricature as being a wave of anti-system sentiments [...] the word “indignation” was a gift : a perfect example of everything and nothing all in one, for this all-inclusive activism using expressions that leave nobody out on the cold. At 95, Stephane Hessel was the ideological father of the pro-democratic rebellion that shook the world. From the Arab Spring to Occupy Wall Street, people have answered his call for insurgence and commitment to a cause. Stéphane Hessel a réveillé l'esprit critique, le sens humain et la raison. Il a encore su initier le mouvement d'indignation politique qui se répand sur les continents en publiant un tout petit livre par le nombre de ses pages mais d'une puissance sans mesure par la portée de ses propos. Stéphane Hessel has awakened critical awareness, human sense, and reason. He has also implemented a worldwide movement of political indignation by publishing a book: a very small book, going by the number of pages, but containing powerful comments of immeasurable impact. Get Angry! Get Involved! – the conscience of the 20th century is talking to us, the voice of a free man who has lived through the best and the worst of what the last century has bequeathed us. Wir denken voller Dankbarkeit an Stéphane Hessel …dankbar für ein Leben exemplarischer Menschlichkeit und tapferen Engagements für die unantastbare und gleiche Würde aller Menschen … dankbar für seine Fragen und Anstöße und noch mehr für seine Ermutigung für uns und sein Vorschußvertrauen auf uns: dem gilt es nun gerecht zu werden. We owe a debt of recognition to Stéphane Hessel…recognition for a life of exemplary humanity and courageous commitments in favor of the inviolable and equal dignity of all human beings…recognition for his questioning and motivation and even more so for his encouragement and trust in us: it is now up to us to rise to the challenge. Un résistant est mort, pas la Résistance! A resistance fighter is dead, but Resistance is not! Nous souhaitons ardemment que la pédagogie civique et la mémoire collective témoigne de l’importance de l’esprit de résistance. Parce qu’avec Stéphane Hessel, c’est une vie consacrée à l’intérêt général et au service d’une certaine idée de la France qu’il s’agit d’honorer. We fervently hope that our civic awareness and collective memory bear witness to the importance of the spirit of resistance. Because in the case of Stéphane Hessel, it means honoring a life devoted to the well-being of all and in the service of a certain idea of France. In February 2012, Twitter introduced a policy that enables individual tweets and accounts to be blocked on a country-by-country basis. If a government submits a court order to Twitter, asking for a tweet or account to be blocked, Twitter will comply. But the blocking will only occur in the country in question — to users throughout the rest of the world, the affected content will look no different. This past October, Twitter enacted this policy for the first time to block tweets from the account of the German extreme right-wing group, Besseres Hannover (@hannoverticker). The German government has formally banned and seized the assets of the group, and some of its members have been charged with inciting racial hatred and creating a criminal organization. The group is also suspected to have sent threatening video messages to Aygul Ozkan, a German-born conservative politician of Turkish origin. 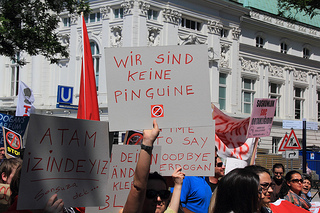 The group announced that it would challenge the blocking in court, but as things stand, Twitter’s move to block the group’s tweets was in accordance with local German law –- something Twitter needs to comply with in order to be able to operate in the country. Twitter’s general counsel, Alex MacGillivray, announced the issue on Twitter and linked to a copy of the request from German police to block the @hannoverticker account in Germany. 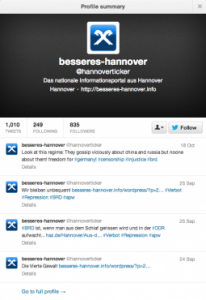 Consistent with Twitter’s previous statement regarding its use of technology and reluctance to withhold content, the Twitter account of Besseres Hannover was not deleted — it was merely made inaccessible in Germany. The case presents a good example of how Twitter will use this new policy, especially in the face of international criticism, which Twitter faced when it first announced this shift. The “one country only” ban has the advantage of ensuring that tweets are not deleted outright. This case alone does not, however, address all concerns regarding this policy. Germans who wish to get around the ban could probably go through virtual private networks (VPNs) – a technique commonly used in countries like China. At the same time, in the case of critical tweets of dissidents — as occurred during the Arab Spring – while the tweets would have been available internationally, they would not have been able to reach their countries’ local populations. While Twitter's policy is certainly more rights-protective than one that would block the tweets altogether (an alternative that would lead to far more censorship in specific countries), it still limits speech that may be important to local and national-level interests or movements. This post is a modified version of a post that originally appeared on the Oxford-based research blog Free Speech Debate.